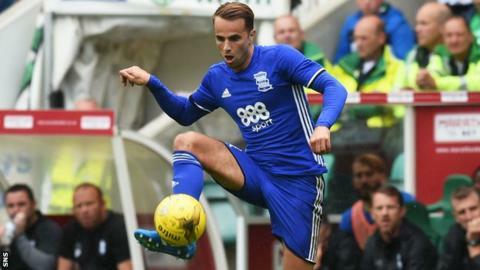 Hibernian have signed Birmingham City forward Andrew Shinnie on a season-long loan, subject to international clearance. The 27-year-old returns to his native Scotland, having joined Birmingham from Inverness Caledonian Thistle in 2013. He was loaned to Rotherham United earlier this year. "I know how big a club this is, how big the fan-base is and a lot of factors came into account," Shinnie told Hibs' website. Speaking on Sportsound on Monday, Hibs head coach Neil Lennon revealed he hoped to sign "another two" after the Shinnie deal was finalised. However, the former Bolton boss said a return to Easter Road for Liam Henderson, 20, was unlikely. The Celtic midfielder, who was given his senior debut by Lennon when he was in charge at Celtic Park, spent last season at Hibs on loan and helped Alan Stubbs' side win the Scottish Cup. "I would doubt that very much," Lennon said of a possible return to Hibs for Henderson. "[Celtic manager] Brendan [Rodgers] has him in his squad. He's obviously Celtic's player. I think Brendan would like the opportunity to work with him. "If Liam were to leave Celtic, I don't think the kid wants to go out on loan any more. If he's going to go, he's going to go on a permanent [move] and I can understand that as well. "We are probably not in a position to do that just at the minute." Lennon is also confident of keeping 21-year-old striker Jason Cummings, who recently signed a new four-year contract and was then the subject of a bid from Peterborough, with the offer potentially rising to £1.7m. "Fans love him, he's at home," Lennon said of Cummings, who has scored 50 goals for Hibs. "I don't think he's ready to go to England just yet. "We got a great offer from Peterborough but we were in a really good position to say, 'thanks, but no thanks'." Hibs have won their opening two Scottish Championship fixtures as they bid to return to the top flight following relegation in 2014. "It's a pretty competitive league," said Lennon, who took over at Hibs in June. "If we are favourites then so be it, we'll embrace it. The players have to get used to having that tag. I don't think they've had that before for a long time. "You'd like to think Dundee United would be there or thereabouts, even though they haven't got off to the best of starts. "Queen of the South have put a bit of money into it, Raith Rovers have started well and Falkirk so I'd imagine those teams would be there or thereabouts. "What I'm hoping is we find a consistent streak early and try and open up a gap and put pressure on the rest that are chasing us." Hibs are the third team Lennon has managed following spells in charge of Celtic and Bolton Wanderers. And he said: "It feels just a really good fit. It's a big club, big city club. I like that about it. People in the background are excellent people to work with. "We've got the fan-base there as well."